Please indulge me in some Sunday morning philosophy. Often, perhaps more often than we’d like, life offers the opportunity to empathize with our fellow human beings, to feel a measure of their grief as they struggle with a challenge. In the theater of the mind, you stand in place for lead role and ask yourself, “how would I feel? What would I do?” The sting of injustice drives you make it right. Then frustration reminds you, there will be no making it right, only making it better. Every day, I ask myself how I can improve the world. Every day, I am keenly aware of the violence that lurks beneath the surface of many human interactions. So many of us are hurt, and the only tools we think we have involve hurting others. We tell each other we have no choice. How many times have we heard there is no choice but to start a war? How many times has the excuse been that if we don’t force you, you won’t do the right thing? How many times has a parent raised his hand to strike a child with the intent to bring peace to the world? We do have choice. Our lives are values that exists for a brief moment of time. 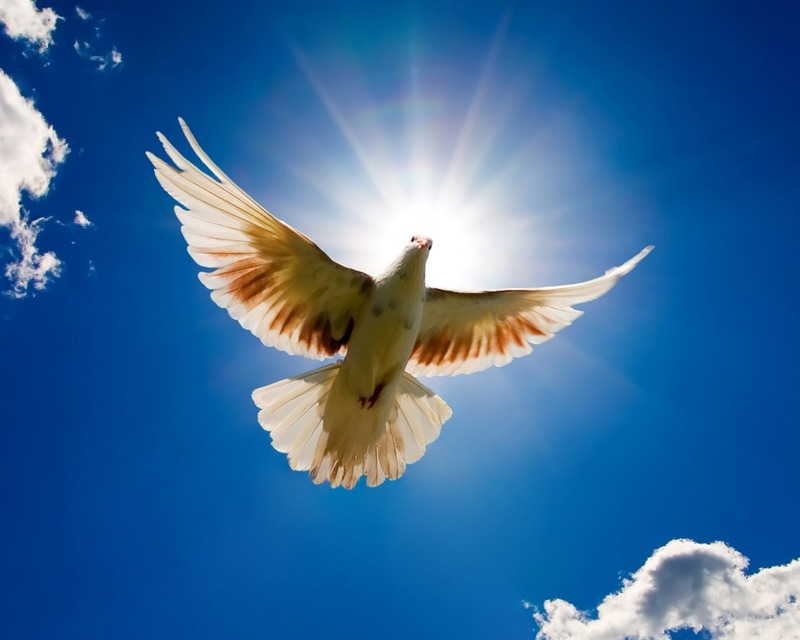 We can surrender to suffering and heartbreak, or we can cooperate to improve life. I choose the latter. I accept that what little power I have in the universe, the most effective actions are those closest to me. One day, there will be no wars, no murders, no violence. I won’t experience it, but I will help it come to be. Closest to me, most precious to me, offering the most hope–are my children. I want my children to learn that all good works on this earth are voluntary. When the bureaucrat from thousands of miles away decrees that I shall donate part of my life for the benefit of others, and that I shall do so or face death, we all suffered. It exploits our good natures and perverts the meaning of charity. And it’s not enough to endure this torment. We can demonstrate an alternative. My principle: meaningful charity is personal and voluntary. I don’t consider the money that the government takes from me to be meaningful charity, regardless of where that money goes eventually. The ends never justify the means. I don’t consider generic, anonymous donations to be particularly effective or meaningful, either. For me, it’s never about sacrifice–it’s about making things better. And it’s about demonstrating how things ought to be. Now let’s make this concrete. There’s a little boy in my community who’s recently been diagnosed with Diffuse Intrinsic Pontine Glioma (DIPG). It’s a brain cancer that’s difficult to treat and offers little hope. I’m having a tough time allowing myself to contemplate the full magnitude of what it would mean to me to be in that situation. There will be no justice. We can only hope to make it a little better than would be otherwise. Time will slip away, and his parents will need help with bills. This is one of those opportunities I mentioned at the start of this post. 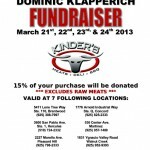 A pair of local restaurants are running promotions today where 15% of purchases will go to the family. That’s great. It gets word out. Three cheers for local business owners doing what they can to aid people in the community. 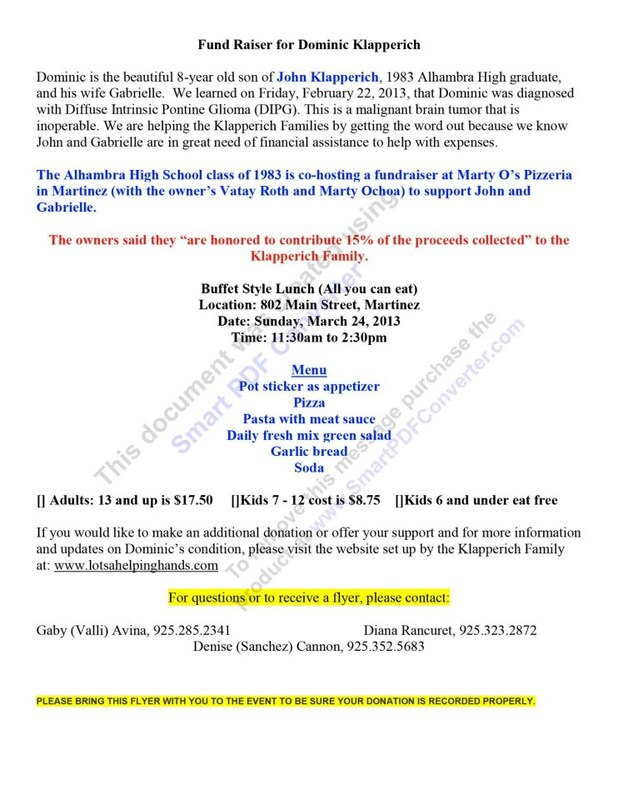 Marty O’s Pizzeria is offering a buffet today. If you choose to go, print out the flyer to the left. 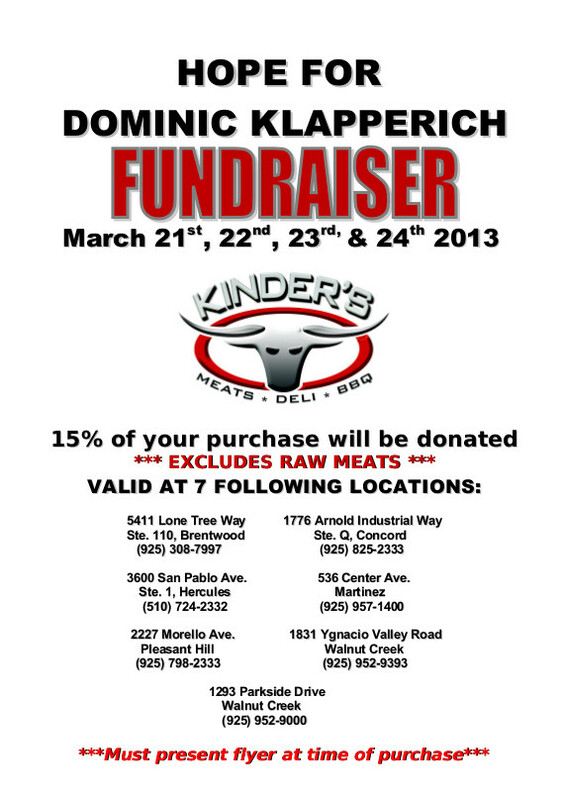 All Kinder’s Meats locations are also donating 15%. You need to bring a different flyer there. 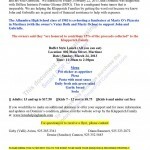 Click the image to the right, or download a PDF version. Alternatively, and the plan that I feel will be most effective, is a direct donation of money. 100% sounds better than 15% to me. My understanding is that this is possible through lotsahelpinghands.com once you are accepted as a member.